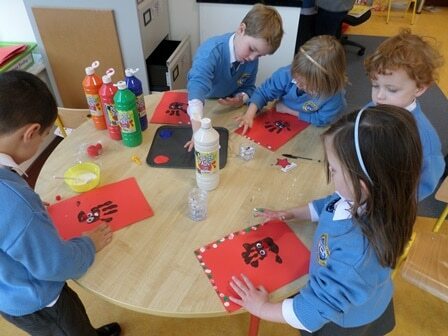 Room 1 have been very busy creating beautiful pieces of art work using their hand prints and their finger prints this week. They created a giraffe linked to our story ‘Handa’s Surprise’ a reindeer as part of our winter art and fairy lights as part of our work on electricity and the dangers surrounding using electricity. The work that Room 1 has produced linked to printing is fantastic and Mrs Swan is so happy with all the new work displayed in her classroom. Well Done Room 1!